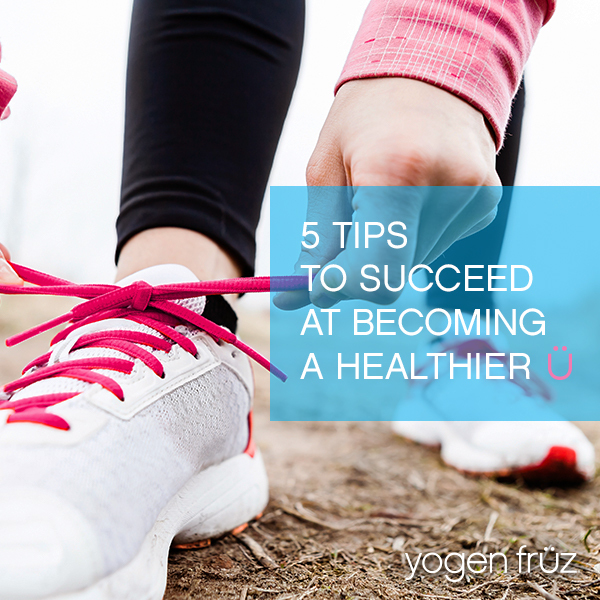 5 Tips to Succeed at Becoming a Healthier ü. With the beginning of every new year comes the explosion of new years’ resolutions. Admirable goals that you intend to accomplish over the next 365 days. One of the most common of these resolutions worldwide is the notion of creating a healthier version of you. Unfortunately, as popular as these new years’ resolutions are they are equally notorious for never being achieved. If your intention for 2016 is to be a healthier you here are 5 great tips to ensure that you successfully accomplish that goal. It’s a lifestyle – Understand you can’t achieve being healthy via a temporary fix. Being a healthier you will require an overall lifestyle change. Commitment and consistency is key! Set specific goals – Being “healthy” is vague and can mean different things to each individual. To one person it can mean losing weight while to another it may mean decreasing cholesterol. Figure out what being healthy means to YOU. If it means losing weight, set a realistic number you want to lose and timeframe you want to do so in. Be active! – Exercise is an essential part of being healthy. But it doesn’t necessarily mean you have to slave away on machines in the gym. Find a form of exercise that you will thoroughly enjoy that way you are more likely to stay with it long term. If you love to dance sign up for lessons or Zumba. Like competitive sports? Join a local league! Don’t do fad diets – Here’s the thing with dieting. Usually they ask you to eliminate a number of things completely out of your diet immediately. You do it for a few weeks. Then you find yourself binge eating that very item you eliminated, negating all the hard work. They key to a healthy diet is moderation. Refer to the Canadian Food Guide for advice on portion control, and how you can incorporate the recommended amount of important nutrients and vitamins into your diet. Track your progress – Having your goal and knowing how you want to achieve it is one thing. Holding yourself accountable is another. Keep a diary tracking your activity and eating habits. This allows you to monitor what positively or negatively affects your progress. It also is great way for you to note milestones and celebrate the little victories! We hope these tips get you successfully started on your way to a healthier lifestyle. Remember, being healthy doesn’t have to be boring! You can still enjoy many of your favourite things at Yogen Früz, as we offer a variety of healthy options including; green smoothies; low fat yogurts; fresh fruit toppings; and acai energy bowls. Try them today!